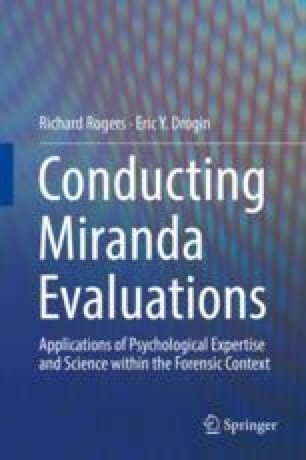 This chapter adopts a “nuts-and-bolts,” highly practical approach to Miranda evaluations. Providing forensic services with an easily understood structure is vitally important, because even seasoned criminal attorneys may scarcely have considered Miranda issues, despite decades of practice. In light of widespread “professional neglect” by lawyers, psychologists and other mental health professionals are often placed in an informal educative role to legal professionals in the criminal justice system. When crafting referral questions, defense attorneys frequently need to overcome their own fundamental misconceptions, such as “everyone knows their Miranda rights.” Beyond referrals, the chapter outlines both core and applied issues, from accepting a Miranda case to conducting an assessment. Goals of Miranda consultations may go far beyond suppressing self-incriminating statements, potentially with a key role to play in plea bargaining as well as at trial.